The Hidden Hand - "Divine Propaganda"
Ok... everyone knows Wino and has high expectations for his musical projects (The Obessessd, Spirit Caravan, St. Vitus, Place of Skulls). This was recorded after Spirit Caravan broke up and is Wino's first really political music. The lyrics are quite powerful and intense. Wino really needs no introduction. You want heavy, pounding guitar riffs, powerful lyrics and some ripping solos, but he waits and puts them in only when necessary. A much more thought out record this time around with some excellent dark ideas. You get it! The CD opens with the excellent "Bellucose Rhetoric". "Oamyata" reminds me of St. Vitus. "Sunblood" is a classic heavy brooding tune (very Sabbath inspired) with some incredibly cool laid back guitar soloing in the middle section. "The Wrong Reasons" is a instrumental piece with a great riff. Really solid playing by Bruce and Dave. Bruce (The bass player recorded and produced the record!). "Tranquility Base" has some intense lyrics. Wino wants to make you think about a few things. He delivers the vocals in a more spoken manner and then kicks you in the face with some wild nasty guitar! "The Last Tree" is a slow Sabbath like anthem with some very cool delay-phase guitar and vocals. 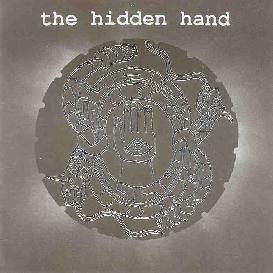 "The Hidden Hand" is an angry song with some violent sounding phase wah that sonically takes over the soundscape at times. The title track is next and is a short under 3 minute rocker. "Prayer For The Night", the longest track at 5:50, closes the CD and is perhaps the best track. A really great moody song with many different elements as it slowly builds up. Perhaps the first real psychedelic rock number I have heard from Wino in quite some time. A must hear CD... what more can I say. For more information you can visit The Hidden Hand web site at: http://www.thehiddenhand.com. Divine Propaganda is distributed by Meteor City. You can visit their web site at: http://www.meteorcity.com.